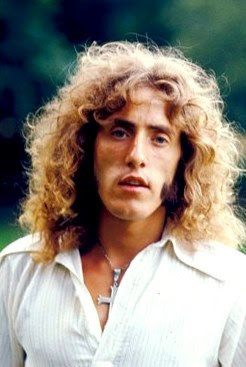 - Roger Harry Daltrey CBE (born 1 March 1944) is an English singer, musician, and actor. In a career spanning more than 50 years, Daltrey came to prominence in the mid-1960s as the founder and lead singer of the rock band the Who, which released 14 singles that entered the Top 10 charts in the United Kingdom during the 1960s, 1970s, and 1980s, including "I Can't Explain", "My Generation", "Substitute", "I'm a Boy", "Happy Jack", "Pictures of Lily", "Pinball Wizard", "Won't Get Fooled Again", and "You Better You Bet". Daltrey began his solo career in 1973, while still a member of the Who. Since then, he has released eight studio albums, five compilation albums, and one live album. His solo hits include "Giving It All Away", "Walking the Dog", "Written on the Wind", "Free Me", "Without Your Love", "Walking in My Sleep", "After the Fire", and "Under a Raging Moon". In 2010, he was ranked as number 61 on Rolling Stone's list of the 100 greatest singers of all time. In 1964, the band discovered another band performing as the Detours and discussed changing their name. Townshend suggested "the Hair" and Townshend's roommate Richard Barnes suggested "the Who." The next morning, Daltrey made the decision for the band, saying "It's the Who, innit?" In 1994, Daltrey celebrated his 50th birthday by performing a two-night spectacular at Carnegie Hall titled A Celebration: The Music of Pete Townshend and The Who, which is popularly also known as Daltrey Sings Townshend. The Who's music was arranged for orchestra by Michael Kamen, who conducted the Juilliard Orchestra for the event. Bob Ezrin, who produced Pink Floyd's The Wall album, among other famous albums, produced the live album. Pete Townshend, John Entwistle, Eddie Vedder (who performed a special acoustic tribute), Sinéad O'Connor, Lou Reed, David Sanborn, Alice Cooper, Linda Perry, the Chieftains, and others performed as special guests. Michael Lindsay-Hogg directed the telecast, which was aired on satellite TV. The concert, at the time, was the fastest sell-out in the famed venue's history.The event was co-produced by Richard Flanzer, his manager at the time. The event was followed by a major tour financed by Daltrey and including John Entwistle on bass, Zak Starkey on drums, and Simon Townshend on guitar. Although the tour was considered an artistic success, it failed to make any profit due to the expense of providing extraordinary musicians and orchestras in every city to replicate the Carnegie Hall event. Significantly, the tour did attract attention to songs from the Who's rock opera Quadrophenia and gathered support for a staging and major tour of the rock opera in 1996–97. In 1996, Pete Townshend was approached to produce Quadrophenia for the Prince's Trust concert at Hyde Park, London. He at first planned to perform the opera as a solo acoustic piece using parts of the film on the screens, but after receiving offers of financing decided on a full-out production. When he first contacted Daltrey to request a collaboration, Daltrey refused, but after some discussion, he agreed to help produce a one-off performance. The opera was performed with a large backing band, including John Entwistle on bass, Pete Townshend on acoustic guitar, and vocals, Zak Starkey on drums, John "Rabbit" Bundrick, and Jon Carin on keyboards, Simon Townshend on guitar, and special guests including David Gilmour, Ade Edmondson, Trevor McDonald, and Gary Glitter. A horn section and backing vocalists were added, along with other actors. On the night before the show, Daltrey was struck in the face by a microphone stand swung by Gary Glitter. The accident fractured his eye socket and caused considerable concern that he might not be able to perform safely, but Daltrey donned an eye-patch to cover the bruises and completed the show as scheduled. Afterward, Townshend decided to take the production on tour in 1996–97 as the Who. After their Quadrophenia tour was successful, the band returned as the Who in a stripped-down, five-piece line-up for tours in 1999–2000. The band continued to work together, making a major impact at the Concert for New York City. After Entwistle's death in June 2002, both Daltrey and Townshend decided to continue with an already planned tour as the Who. Bass player Pino Palladino was chosen to fill Entwistle's place. The band also completed a brief tour in 2004. In 2006, they released their first studio album of new material in twenty-four years, Endless Wire, leading some fans and critics to say that the highly acclaimed artistic tension within the Who lay between the two principals Daltrey and Townshend. The band completed a world tour in 2006–07 to support this album. "Anyway, Anyhow, Anywhere" (1965) – The Who's second single, co-written with Townshend. "See My Way" (1966) – Daltrey's contribution to A Quick One. "Early Morning Cold Taxi" (1968) – Outtake from The Who Sell Out (later appearing as a bonus track on deluxe editions), co-written with David "Cyrano" Langston. "Here for More" (1970) – B-side to "The Seeker". Daltrey also wrote a song titled "Crossroads Now" for the Who which grew out of an onstage jam session in 1999 after the song "My Generation." Another Daltrey song, entitled "Certified Rose", was rehearsed by the Who shortly before the death of John Entwistle. The band had planned on playing it (as well as Townshend's "Real Good Looking Boy") during their 2002 tour, but plans were halted after Entwistle's death. Although it was rumoured that a studio version was recorded during the Endless Wire sessions (and may have featured Entwistle's basslines from 2002), Townshend later stated that no such recording was made. A more recent recording of "Certified Rose" was finally released on Daltrey's 2018 album As Long As I Have You. While this version of the song was released as a Daltrey track, it features Townshend on guitar. "Early Morning Cold Taxi", is a song recorded during The Who Sell Out's recording sessions in 1967, and was released in 1994 on the Thirty Years of Maximum R&B box set, which is credited to Roger Daltrey and Who roadie Dave "Cyrano" Langston. Some sources report that the song was solely written by Langston. At the time Daltrey and Langston were planning to form a writing partnership, in which all songs written by either of them would be credited as Daltrey/Langston. The partnership produced only one other song—an unreleased demo titled "Blue Caravan." Langston went on to play guitar on John Entwistle's debut solo album, Smash Your Head Against the Wall, in 1971. Daltrey has released eight solo studio albums. The first was the self-titled Daltrey in 1973, the album was recorded during a hiatus time in the Who's touring schedule. The best-selling single from the album, "Giving It All Away", peaked at No. 5 in the UK and the album, which introduced Leo Sayer as a songwriter, made the Top 50 in the United States. The inner sleeve photography showed a trompe-l'œil in reference to the Narcissus myth, as Daltrey's reflection in the water differs from his real appearance. He also released a single in 1973, "Thinking" with "There is Love" as the B-side. The British release, with considerable airplay of "Giving It All Away" (first lines "I paid all my dues so I picked up my shoes, I got up and walked away") coincided with news reports of the Who being sued for unpaid damage to their hotel on a recent tour, including a TV set being thrown out of the window. When Sayer launched his own career as a solo artist, Daltrey called on a widening group of friends to write for and perform on his albums. Paul McCartney contributed the new song "Giddy" to One of the Boys, where the band included Hank Marvin, Alvin Lee, and Mick Ronson. On this album cover, another visual trick is played with Daltrey's mirror image, with reference to René Magritte's famous painting Not to be Reproduced. The title track to Under a Raging Moon was a tribute to the former Who drummer Keith Moon, who died in 1978, at the premature age of 32. On his next album Rocks in the Head, Daltrey's voice ranges from a powerful bluesy growl à la Howlin' Wolf to the tender vocals shared with his daughter Willow on the ballad "Everything a Heart Could Ever Want". This was his first major effort as a songwriter for his own solo career. Daltrey embarked on a solo tour of the US and Canada on 10 October 2009, officially called the "Use It or Lose It" tour with a new touring band he called "No Plan B" on the Alan Titchmarsh Show. The band included Simon Townshend on rhythm guitar and backing vocals, Frank Simes on lead guitar, Jon Button on bass guitar, Loren Gold on keyboards, and Scott Devours on drums. Eddie Vedder made a guest appearance at the Seattle show on 12 October. In 2010, Daltrey and No Plan B appeared for several dates with Eric Clapton, including Summerfest at Milwaukee, Wisconsin. The band also scheduled additional dates in 2010 without Clapton. As of 2013, Daltrey is talking about making a new solo album because "the Who don't do enough gigs for me. If I stop singing at the age I am now, my voice will be gone within two years. So I've got to keep it going. It's like a car engine you've got to keep running." In November 2014, while staying at the Mar Hall Hotel in Bishopton, Renfrewshire – ahead of the Who's gig at The SSE Hydro – Daltrey joined the band Milestone for an impromptu rendition of "I Can't Explain". The band were playing at a wedding reception in the hotel. Daltrey hand-built his first guitar from a piece of plywood, and also built guitars for the band in the early days when they had little money to buy equipment. As lead guitarist for the Detours, Daltrey played a 1961 Epiphone Wilshire solidbody electric guitar which he later sold to Pete Townshend on an easy payment plan. After he took over vocals for the band in the 1960s, and during the 1970s, Daltrey rarely played guitar on stage; however, he played a Martin acoustic guitar for appearances to promote his solo album Daltrey. He began playing guitar with the Who again during the band's tours in the 1980s, and used a Fender Esquire to play a second guitar part for the song "Eminence Front" on the Who's 1982, 1989 and later tours. During the 1989 tour, he played a Gibson Chet Atkins SST guitar for the song "Hey Joe". During the Who's 1996–97 Quadrophenia tour, Daltrey played a Gibson J-200 acoustic guitar. - Who lead singer Roger Daltrey forged a parallel solo career beginning in 1973, when the group had begun to fall apart in the aftermath of Quadrophenia. Born March 1, 1944 in London, Daltrey grew up in the same Shepherd's Bush neighborhood as future Who bandmates Pete Townshend and John Entwistle, performing with them as the Detours as early as his late teen years. Over time, Daltrey developed into one of rock's most powerful lead vocalists, a position to which he staked his claim on the Who's 1971 masterpiece Who's Next; his on-stage persona was one of macho swagger, accompanied by such antics as twirling his microphone like a lasso. Daltrey first traveled the solo route in 1973 with an album titled simply Daltrey, featuring mostly material penned by a then-unknown Leo Sayer that served as a departure from the Who's signature hard rock sound. The Who reconvened for The Who by Numbers in 1975, a year that saw Daltrey release his second solo album, Ride a Rock Horse, and appear in Ken Russell's films Lisztomania (as composer Franz Liszt) and an adaptation of Tommy (in the title role). While the Who went on hiatus for several years, Daltrey released One of the Boys in 1977 and appeared in the 1978 film The Legacy. During the Who's post-Keith Moon era, Daltrey co-produced and starred in the film McVicar, a biography of train robber John McVicar; members of the Who appeared on its soundtrack, which essentially served as a full-fledged Daltrey album and found him bridging the gap between hard rock and the pop songs of his earlier solo work. After the Who officially disbanded in 1983, Daltrey's solo albums became uniformly hard-rocking affairs, most notable among them 1985's Under a Raging Moon. In addition to the Who's 1989 reunion tour, Daltrey continued to act in occasional television and film roles, as well as releasing the solo album Rocks in the Head in 1992. To celebrate turning 50, Daltrey played two nights at Carnegie Hall in 1994 and the recordings were issued later that year as A Celebration: The Music of Pete Townshend and the Who, with a companion DVD surfacing in 1998. In 1999 he performed alongside artists such as Darlene Love and Zak Starkey at a Royal Albert Hall show by an act billed as the British Rock Symphony. Fueled by a full orchestra and gospel choir, the set list consisted of classic material originally performed by the Who and their contemporaries. A related studio album followed, as did wider European and U.S. tours, before a live DVD appeared in 2000. Daltrey returned to the Albert Hall in November 2000 for the inaugural Teenage Cancer Trust benefit show. He became a patron of the charity, overseeing a run of yearly star-studded events at the venue that lasted well into the next decade. In May 2006 he performed "Highbury Highs," a song especially written for a ceremony to mark Arsenal's final football game at the Highbury Stadium in North London. By 2009 he was touring the U.S. once again with a lineup that included Pete Townshend's brother Simon, and Daltrey retained this band for a 2011 Teenage Cancer Trust performance of Tommy. In November 2013, a mere six months after his friend and former Dr. Feelgood guitarist Wilko Johnson was diagnosed with pancreatic cancer, Daltrey accompanied him on sessions for an album entitled Going Back Home. Featuring reinterpretations of material from throughout Johnson's career, the record was launched with a gig at the Shepherd's Bush Empire in February 2014. He continued his charity efforts by recording a cover of Townshend's "Let My Love Open the Door," of which all sales proceeds benefited Teen Cancer America. - Known nowadays for his acting roles as well as his vocals as frontman for The WHO, ROGER DALTREY (born 1st March, 1944, Hammersmith in London) has unified both careers since his title role of the pinball wizard in Ken Russell’s 1975 film adaptation of his group’s `Tommy’ opus. While the band’s main songwriter PETE TOWNSHEND exhibited his showman antics by way of “windmill”-arm guitar style, the muscled DALTREY found his stage niche through his lasso microphone projectile; it was not a good idea to stand too close to either of them; JOHN “The Ox” ENTWISTLE was squeezed somewhere in between the pair and the destructive sticksman KEITH MOON. While all but the latter had kick-started their extracurricular solo careers, Roger’s finally got underway in 1973 via Top 10 set DALTREY. Almost unique, the singer hadn’t really taken to the songwriting aspect of stardom, and this record was no exception, as Dave Courtney and rising star LEO SAYER took the majority of the workload; 60s icon and co-producer ADAM FAITH delivered a few (`Way Of The World’ and `You And Me’) alongside Dave. Opening with `One Man Band’ (a UK Top 10 hit for SAYER in ’74), and major UK charters `Giving It All Away’ and `Thinking’, it had plenty to offer WHO fans willing to try a bit of pop-rock diversions. With either Russ Ballard or Paul Korda to rely on in the writing department (PHILLIP GOODHAIT-TAIT contributed `Oceans Away’ and a cover of RUFUS THOMAS’ `Walking The Dog’ were a few exceptions), RIDE A ROCK HORSE (1975) would be left in the stalls critical-wise, although it did hit the Top 30 on both sides of the Atlantic. While Ken Russell had cast him as Franz Liszt in his much-lambasted, 1975 high camp re-invention of the classical composer’s life (`Lizstomania’), in which the WHO frontman also contributed some vocals to RICK WAKEMAN’s score, DALTREY would find solace in his main role of the “deaf, dumb and blind” kid in `Tommy’ alongside thespians Oliver Reed and the delicious Ann-Margret. Turning again to GOODHAND-TAIT (on `Parade’ and `Leon’) and Korda (`Written On The Wind’), while utilising ballads from COLIN BLUNSTONE (`Single Man’s Dilemma’), Andy Pratt (`Avenging Angel’), PAUL McCARTNEY (`Giddy’), MURRAY HEAD (`Say It Ain’t So, Joe’), Steve Swindells on a couple and STEVE GIBBONS for the title track, ONE OF THE BOYS (1977) was a slight return to form; esteemed session alumni ranged from guitarists CLAPTON, MICK RONSON, ANDY FAIRWEATHER-LOW, ALVIN LEE, Jimmy McCulloch, HANK MARVIN to bassist ENTWISTLE and keyboard wizard ROD ARGENT. The following year saw DALTREY appearing in Richard Marquand’s second division chiller, `The Legacy’, a year sadly (1978) that was tinged with sadness when the enigmatic MOON let go his mortal coil. Refreshed and ready to work again, Roger landed one of his most accomplished screen roles in McVICAR (1980), a bio-pic of the reformed gangster which saw him both acting and handling the “solo” soundtrack (backed up by the remaining members of The WHO plus Kenney Jones and John “Rabbit” Bundrick). DALTREY’s pet prison-flick was a more adventurous proposition, the most ambitious solo venture of his career in fact. Unlike most of his 70s material, it also sounded like The WHO, albeit a WHO on the verge of redundancy. Fascinated by McVicar’s life story, the singer had bought the rights to the man’s book, co-produced the movie, took the lead role and performed most of the soundtrack (Dennis Waterman, anyone?). He’d also drafted in former ARGENT guitarist/freelance song-slinger Russ Ballard (again! ), War Of The Worlds mastermind Jeff Wayne, and one-time Andrew Loog Oldham songwriting protégé Billy Nichols, as well as the likes of Herbie Flowers and drummer Dave Mattacks. Fresh from dusting off RAINBOW’s rock-out classic `Since You Been Gone’, Ballard struggled to match that standard here, coming up with the sub-RUTS bass-rocker, `My Time Is Gonna Come’ and `Free Me’, a horn-charted chug which edged into the UK Top 40. DALTREY at least gives it the kind of iron-lunged intensity which his role demanded, but his passion is better directed on the bluesier Nichols-penned numbers: `Waiting For A Friend’ (ironically the only single which failed to chart), and the ballsy, valedictory title tune. As a proxy final fling, though, DALTREY and Co would perhaps have done better to bow out with McVicar than `Face Dances’ or `It’s Hard’. 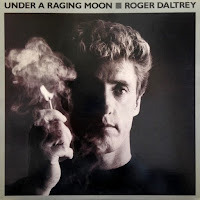 Following The WHO’s split in 1983, DALTREY continued on his solo sojourn of sorts, releasing three sets in relatively quick succession:- PARTING SHOULD BE PAINLESS (1984), UNDER THE RAGING MOON (1985) and CAN’T WAIT TO SEE THE MOVIE (1987). While fans found it frustrating that Roger was taking steps down to the basement of rock’n’roll, the second of these at least produced a bit of depth via songs from TOWNSHEND (`After The Fire’ – a minor hit), BRYAN ADAMS (`Let Me Down Easy’) and Geoff Downes-John Parr’s title track. Roger duly concentrated on acting with roles in various minor movies, including `Mack The Knife’ (1989), `Buddy’s Song’ (1991) – as father of popstar Chesney Hawkes, `Teen Agent’ (1991), `Lightning Jack’ (1994) and `Chasing Destiny’ (2000). Always ready and willing to return to The WHO at the drop of a stage prop (as the ups and downs of The WHO continued unabated), there was one further set by the singer, ROCKS IN THE HEAD (1992). Self-penned by himself and Gerard McMahon, his 90s direction was again mainstream, although harder-edged than his downscale 80s efforts; from `Who’s Gonna Walk On Water’ to its finale `Unforgettable Opera’, DALTREY was at least trying to get back on the right track. Slightly confusing but a real live document nevertheless, A CELEBRATION: THE MUSIC OF PETE TOWNSHEND & THE WHO (1994) was down to Roger and a celebrity guest list (ENTWISTLE, TOWNSHEND himself, The CHIEFTAINS and Linda Perry of the 4 NON BLONDES) and an orchestra on re-treads of symphonic rock songs from `Tommy’, `Who’s Next’ and `Quadrophenia’. Like that other ageing rebel JOHN LYDON, Roger subsequently took to adventurous, hands-on presentation of ostensibly educational TV shows like Extreme History, while he continues to run a trout farm in Dorset. He’s since reactivated The WHO as a studio outfit with Pete, releasing the back-to-form and high-charting `Endless Wire’ in 2006.